I have fond memories of Fruit Salads. You know the canned Fruit Salad (Fruit Cocktail) that has all those tiny pieces of fruit and maraschino cherries in an overly sweet sugar syrup. As a kid, I loved it, especially when my Mom would pour it over a scoop of vanilla ice cream. But, as is often the case, our tastes change over the years, and I now want my Fruit Salad to be a little more "fresh and natural" tasting. So I started making a lightly sweetened sugar syrup, flavoring it with lemon and orange juices and some Limoncello (an Italian liqueur), and then tossing in a hodgepodge of fresh (and even dried) fruits. 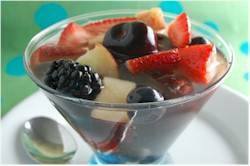 The result is a delicious mixture of fruit and syrup that really showcases the flavors of all the fruits. While you can serve the Fruit Salad immediately, my preference is to chill it for several hours (or even overnight) so the sugar syrup has time to both soften and flavor the fruits. I enjoy this it for breakfast, or as a snack, and I also still like it poured over a scoop of vanilla ice cream. A sugar syrup, also called a simple syrup, is just a boiled mixture of sugar and water that is often used to soak cakes and pastries. The ratio of sugar to water can vary depending on how sweet you want the syrup to taste, and on the sweetness of the fruits you use. Now, there are so many ways to flavor the syrup and it's fun to experiment. For this recipe I'm using fresh mint leaves, lemon and orange juices, and Limoncello (an Italian lemon liqueur made from lemon rinds). But some other ideas are to add the seeds from a vanilla bean, or maybe a cinnamon stick, fresh lavender is very nice, as is adding a few whole cloves. When making a fruit salad, the quality of the fruit will determine how flavorful your salad will taste. Summer does offer the widest selection of fresh fruit (all kinds of berries, peaches, cherries, nectarines, apricots, and plums), but even in the dead of winter there are fruits like apples, oranges, pears, pineapple, seedless grapes, kiwi, and bananas to choose from. And don't forget about adding dried fruits, as dried figs, cranberries, cherries, apricots, and raisins add both color and flavor to fruit salads. It is best to cut large fruits, like apples, pears, and peaches, into bite size chunks or wedges. Cantaloupe and honeydew can be cut into pretty round balls with a tool called a melon ball scoop. If using oranges or grapefruit, you may want to remove the rind and the inner white pith as it can be quite bitter tasting. The fruit then needs to be separated into sections and all the seeds removed. Do this over a bowl to catch any juices. And pour all the extra juice into your syrup. You can serve the fruit salad cold or at room temperature. Fruit Salad: Place the water and sugar in a small saucepan and bring to a boil, stirring occasionally. Let boil about three minutes then remove from heat and cool to room temperature. Stir in the Limoncello, lemon juice, orange juice, and mint leaves. Add about 6-8 cups of fresh and/or dried fruits. While you can serve the fruit salad right away, I like to cover and refrigerate the salad for a few hours hours, or even overnight, so the fruits have time to absorb the sugar syrup. Some fruits, like bananas, should not be added to the sugar syrup until shortly before serving. Serve the fruit salad cold or at room temperature. Makes 8 - 1 cup servings. Preparation time 20 minutes.